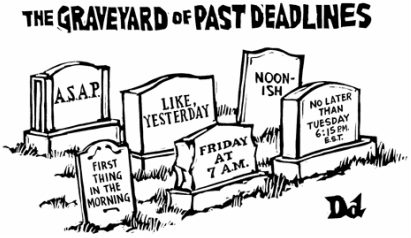 Blog - Kristen L. Guth, Ph.D.
Why can’t I get everything done? No matter how hard I try, it always seems that there’s not enough time to check off every item on the day’s to-do list. Although I’d like to chalk it up to procrastination, that’s just not the case. It used to be that when I did complete most everything, it occurred with little sleep and lots of asceticism as I flogged myself into misery. I have survived to this point (i.e., finishing the third year). So over the next few weeks, I’m going to share some life management tips that have helped me. Today, it’s about sleep. I didn't realize how much difference an adequate amount of sleep made until I finally had some. For adults, the National Institutes of Health recommends 7-8 hours, and the National Sleep Foundation recommends 7-9 hours. My batting average didn’t even come close: maybe 3-5 hours a night to complete work for three classes. After a few semesters of absolutely deplorable sleeping habits, I turned into a zombie. I didn’t really go for brains, but my diet changed to a perpetual state of “I don’t care as long as it’s food” because I didn’t have the energy to think through my options. With an In-N-Out located at the end of my street, this posed a problem. Despite my weekly visits, my weight didn’t skyrocket. In fact, I lost weight because I was also overscheduled to the point that I couldn’t make good choices about my time, and consequently didn’t eat regularly. When I got home most days, it was better to crash than think about facing aisles of raw ingredients at the grocery store, which would demand more thinking for meal construction. You can see how this is an awful spiral. Of course, sleep doesn’t change your diet, but it impairs performance and memory. Looking back, I’m surprised I was not perceived as more than a train wreck. Something had to change, but I needed to know what I was up against. To be honest, I’ve never been great at food diaries or any other type of diary. But apps have made the inconveniently hard work that goes into that sort of tracking disappear. Rather than the unknown goals that typify app use and the quantified self, I had a determinist justification: better and more sleep. To get my sleeping habits under control, I browsed through sleeping apps (here’s a good list if you’re in the market). I’ll recount how I use mine (SleepCycle for $0.99) to stave off grad school under-eye circles. I found that instead of fighting me, my body cooperates better with a routine. Here’s my schedule now: 30 minutes before bedtime on weeknights, a normal alarm on my phone reminds me to begin shutting down for the night (that’s new this semester). Then, once in bed, I set my SleepCycle alarm, put it face down, and set off to sleeping. That’s it – the app tracks my sleep movements and gives me a morning report on how much I slept and my sleep quality (deep and restful vs. tossing and turning). I committed to tracking my sleep starting in the fall of my second year of the Ph.D., and I have watched the patterns change for the better during the past year and a half. I began retiring earlier in June 2014 because I added another behavior-shaping constraint: I shifted my workouts from whenever-I-could-go-to-the-campus-gym to early morning. 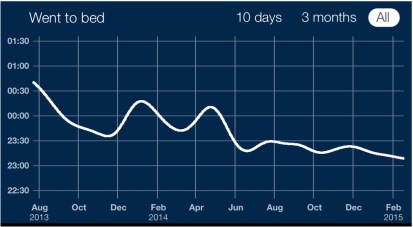 Sometimes, I was on travel or in a place where I couldn’t use Sleep Cycle, but the app smoothes out data drops to estimate general patterns over time. The app provides over time estimates as well as daily estimates. 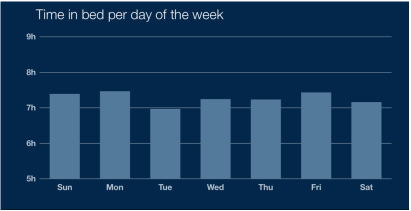 On average, my time in bed tends to be within 7-8 hours. I know this is on the shorter side of the recommended time, but at least I’ve made it to the range! The worst nights of the week are – you guessed it – Tuesday, Wednesday, and Thursday when I’m thinking most about my deadlines and work for the next day. 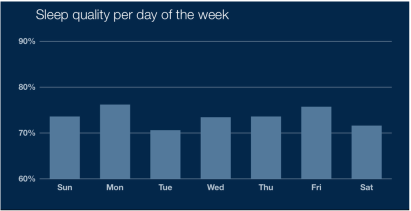 Sleep quality tends to follow the pattern of the amount of time I spend in bed, with fewer average hours correlated to a lower average sleep quality per day. After implementing the app, I began to get the sleep I needed, and made better choices about what to eat and how to arrange my schedule. I became more balanced. I was so encouraged that I started to combat exhaustion I felt after coming home from a full day of work, and then collapsing on the couch for a Netflix binge at 6:30 p.m. There were still several hours for working left in the day, but I found myself giving up on productivity. I’ll admit, this is still a struggle, but it’s been curbed by employing “emergency naps,” which refresh memory, cognitive skills, creativity, and energy levels. The app I used to relax and take a quick power nap is Pzizz, a free app that helps me unwind with some narration and ethereal background sounds. You can also use it for sleeping. I think the choice to change habits is the most difficult part of this process, but it can be done with slow improvements over time. I found some apps to help me manage and monitor my sleep. Have you found anything helpful in this article or developed techniques during your own adventure time of grad school? Next week, I’ll review some outsourcing services to delegate work for which you don’t have time.